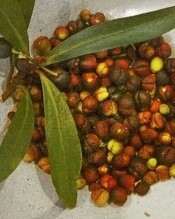 Hand-cut quandong stones or seeds for craft-work or cultivating. These have all been hand-cut so there is no blemishes on the stones at all. 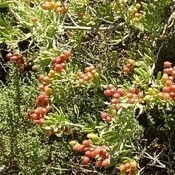 Quandongs are a native to Australia, they prosper in a hot dry climate. Many of the quandong stones are now machine cut to get the fruit off the stone, this often impacts on the stone themselves with cut marks. All stones that I have available have been carefully hand-cut. Australian Mountain Pepperberry bush is a shrub/small tree of 4 to 5 metres. This shallow rooting plant dehydrates on hot days so it will need a good water supply and plenty of shade. The leaves can be used throughout the year and make an excellent peppery additive when cooking a wide range of dishes. The berries (produced on female plants) are very hot, and when dried they can be used with a pepper grinder. This pack contains 30 seeds and also includes instructions for germination and harvesting. Buy some today to have your own supply of this delicious herb. 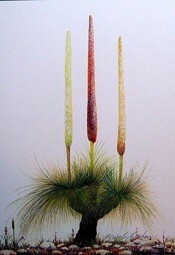 Its natural habitat is in the cool, moist, elevated areas of Tasmania and south-east Australia. 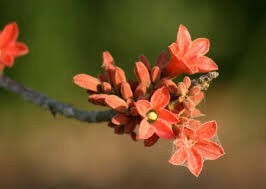 Bats Wing Coral Tree can grow up to 10m The bark has thick thorns and the flowers are bright red and pea shaped, flowering from November to December. Honey -eaters love the sweet nector from the flowers. It's a native of NSW, QLD. NT. SA & WA, it prefers ight to medium soils in an open sunny position is drought resistant, but can be a little frost sensitive. ; It reuqires watering in Summer but don't over water. ; Requires good drainage. I have often seen the seeds from this tree made into necklaces by the Aboriginal women. ; The large seeds are bright red, they would made some bush-string and then thread the seeds on for a really decorative necklance. ; This pack contains 3 large seeds. Dichopogon strictus. These beautiful lilies, with the chocolate scented flowers, were favoured as a great bushfood treat and for their nutritious tubers by Aboriginal people for generations. These beautiful lilies with the chocolate scented flowers were eaten for their nutritious tubers. Always remember to leave enough to reseed for the next year as the Aboriginal people did. 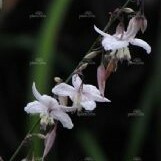 The long lasting flowers are visible from August to February and grouped together are a wonderful addition to any garden. The packet contains approximately 30 seeds and instructions for propagation. Traditionally grass trees were of great importance to the Aboriginal population, they ate the fresh new leaves and extracted starch from the upper portion of the trunk CLIMATE: Tropical to temperate to cool NATURAL HABITAT: Widespread across the Eastern and Southern states FEATURES: A striking erect plant with a crown of wiry slender leaves. 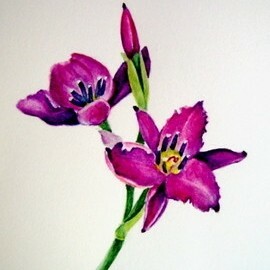 This is a painting courtesy of botanical artist, Beverley Graham PLANTING & CARE: A pack of 10 seeds. Sow in good quality native potting mix. Plants are very hardy, are frost and drought tolerant, but are very slow growing. ; Traditionally grass trees were of great importance to the Aboriginal population, they ate the fresh new leaves and extracted starch from the upper portion of the trunk. This beautiful plant with the delicious fruit that taste like spicy apples, muntries grow naturally around Western Victoria and Eastern South Australia. Muntries are also known as emu appless and native cranberries, they were a favourite of the Aboriginal people and the early settlers. ; Muntries likes light, free draining soils and the temperate conditions of southern Australia. 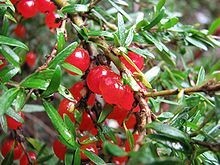 It is naturally prostrate but can be trellised into an upright shrub for easy harvesting. ; When ripe the berries are green with a red tinge. Best planted around late autumn to mid winter. They have four times the anti oxidant as blue berries and have a natural wax that is good for skin nourishment. This pack contains 30 seeds and propagating instructions. 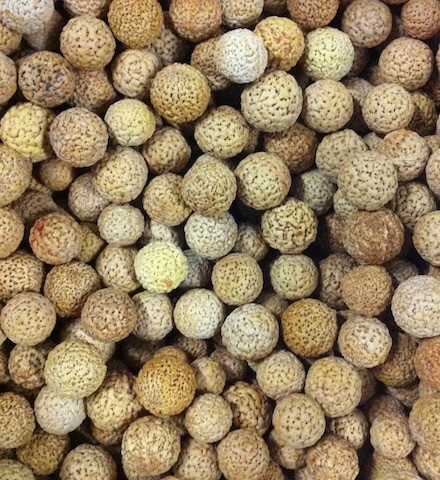 A great bushfood herb with a variety of uses. Native Thyme is a hardy plant once it gets going. Native Thyme is related to the Indian Sacred Basil Ocimum sanctum. Grow your own native thyme. This perennial plant grows easily from seed and leaves can be picked throughout the year for garnishing or as a native tea. Once established this plant is very tough and will provide you with year round food. The plant grows in the same way as basil or mint and can be used in tomato dishes, soups, salsas, salads. 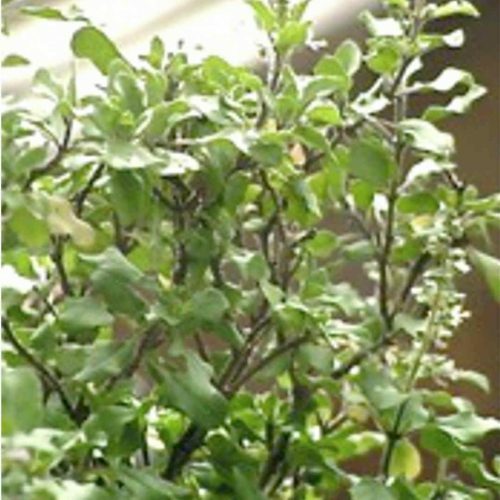 The German explorer Ludwig Leichardt called the plant "wild marjoram" and used the leaves to make a tea. 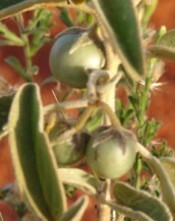 Nitraria billardiera. Nitre bush tastes like salty grapes. This pack contains 10 seeds and propagating notes. 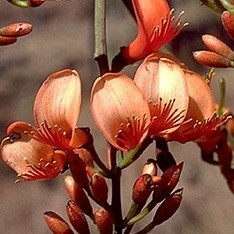 The Nitre Bush grows throughout SA and inland NSW. It forms a sprawling shrub to 3m tall with red fruit in summer and autumn. 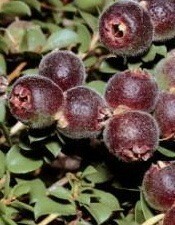 The fruit are said to taste like salty grapes, and were a favourite of the tribal Aboriginies of the area. Nitre bush tastes like salty grapes. Arthropdoiu milleflorum. 30 seeds per pack. A beautiful flowering tuber, the plant is used by the indigenous people as a bush medicine, the tuber is the part that is eaten.